The creative focus of this exhibition is the wedding feast. On the ground floor, musicians receive the party. The festively laid table is ready for the banquet. This is where today's wedding dresses are presented. If you like, you may select a dress to try on. 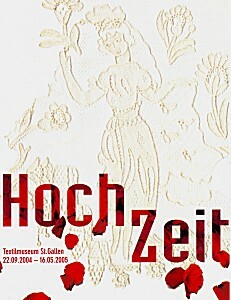 Wedding photographs, wedding garments and wedding stories from the people of St.Gallen accompany visitors on their way to the second floor. In this hall, too, a festive table awaits them, around which a wealth of bridal gowns demonstrate their development in terms of history and fashion. 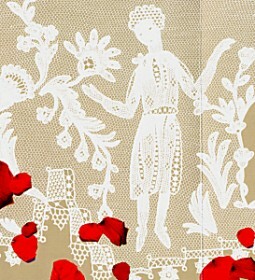 Textiles in showcases elucidate the themes of love, marriage tokens, trousseaux and weddings. The pomp and circumstance surrounding weddings has been considerable from time immemorial. Very early on, townships decreed rules to limit festivities, the amount of the dowry, presents and  to no one's surprise  the garments worn by brides. Representations and written records of bridal gowns only started in the 15th century. There was a great diversity of wedding garments. The bride wore her best dress, with a bridal wreath indicating her status as a bride. From the 17th century onward, France determined Europe's cultural life, and brides now dressed in the French fashion. Records refer to white wedding dresses earlier than the 19th century; however, there is no evidence of how widespread white weddings were. The precursors of the white bridal gowns are likely to have been the white diaphanous garments that were in fashion about 1800. In 1826, the Petit Courrier des Dames presented a white wedding dress for the first time. The first princess to wear a white dress was the English Princess Victoria at her wedding to Prince Albert of Saxe-Gotha in 1840. Princess Elizabeth of Bavaria still remains the most beautiful bride of the 19th century. At her wedding to Emperor Franz Joseph I. in 1854, Sisi wore a dress of pure white duchesse silk. Until the late 19th century, white wedding dresses were the prerogative of rich daughters. Other brides got married wearing a white veil and a black dress, which remained their best dress after the wedding. It was only in the early 20th century that the white wedding dress established itself, and it was soon regarded as traditional. Even today, a white wedding stands for all the dreams of love, and it is a symbol of romanticism and happiness. The conventional wedding dress combines elements of the 19th century bridal gown, namely a closely fitting bodice, tapering at the waist, and with a long white skirt. In rural areas, about 60% of all the brides still walk up the aisle in these charming and romantic bridal dresses. Quite soon, however, only a third of all brides will be likely to opt for a traditional dress. Up to the millennium, the bride was a princess for a day; the wedding day was her day, and the bridegroom, in a black suit, remained discreetly in the background. Today, this would appear to be changing. For the modern bridal pair, love is the only reason for marriage. This is why it is no longer the bride alone who occupies centre-stage on her wedding day; the bridegroom, too, wants to be the world's most handsome man.